Does your dog experience anxiety when left at home? Are the neighbors complaining of constant barking or whining? Is there damage near your windows or doors? Are you finding potty accidents when you return home? Does your dog greet you as though they haven’t seen you in months when you return after work? Does your dog follow you around as if they are attached by a tether? Does your dog chew up your things when you leave him home alone? Do you think your dog is guilty when you return? Do you think he is angry at you for leaving? Have you noticed the carpet being wet when you return, but your dog didn’t have an accident? Does your dog seem to be panting heavily when you return? If you answered yes to any of the above questions, your dog may be experiencing some form of home alone issues, often referred to as Separation Anxiety. Separation anxiety is a panic disorder that occurs when the dog is left home alone (or at its extreme, separated from his most coveted human). Separation anxiety can be triggered by a wide range of things including moving to a new home, loss of a family member, traumatizing experience, sudden change in the families schedule, loss or arrival of a new pet, being re-homed, etc. Unfortunately, it does not get better with time, it usually gets worse. Can Separation Anxiety be resolved? YES! Separation anxiety is treatable. 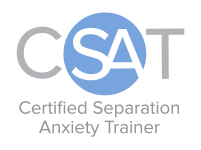 Myself and a handful of other trainers have earned their Certified Separation Anxiety Trainer (CSAT) credentials. This is the highest qualification given to trainers who want to work with dogs that have issues being left home alone. We treat each dog as an individual and can work with you and your dog no matter where you are located. YES! The beauty of this program is that we work completely remotely. The whole idea of helping your dog overcome separation anxiety is to get you out of the house. That will be much harder to do if I am present. Using a special software platform, google sheets, and a webcam we can accomplish more than we ever could in person. This also helps to keep the cost down. Schedule a FREE 20-Minute phone consultation. During your consultation we will go into detail about your dog’s behavior when you leave home. We will gather information and give you the information you need to understand how we can support you thru changing your dog’s feelings about being left home alone. When the call is over, you will get a follow up email containing a summary of what was discussed. This is a no obligation phone call. If you are ready at the end of the call to get started, we will move forward. If you need time to think it over or need more questions answered, we are here to ensure you have all the information you need.